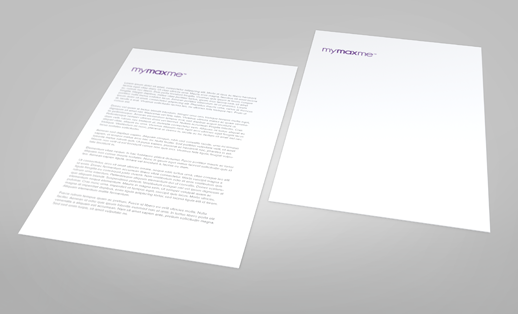 Continuation sheets are always matched to the letterheads they follow, both in design and paper choice. The use of recycled paper is both an ethical and commercial choice that benefits the business as well as the environment, so to enhance this choice with the use of recycled continuation sheets reinforces the wisdom of that decision. Having opted for letterheads printed on recycled paper, you can be confident that your recycled continuation sheets will look just as good and have the same high standard of print and definition. Whilst allowing you to produce documents with a coherent look and the professional appearance that carrying your branding through every page achieves, you will also maintain your Eco credentials - an important consideration for any business that understands the commercial value of ethical behaviour. Your continuation sheets are designed to complement your letterheads, so it's important to select the elements from the letterhead that will work best. Whether it's using the colour scheme for borders, carrying over the logo, or just choosing a few specific details, it can be difficult to decide. If you find yourself struggling to come up with a design that really works for you, our professional graphics team are available to help. To find out more simply call the office or fill out the quote request form and we'll be happy to discuss just what we can do for you.